My ALYoF goal for this month was to complete the top, and that I did (just under the wire). I love it! I love it! I LOVE envisioning a quilt in my head, and over the course of a month, seeing it come to life. It is the best when there aren't too many piecing problems, and this one went together easily. 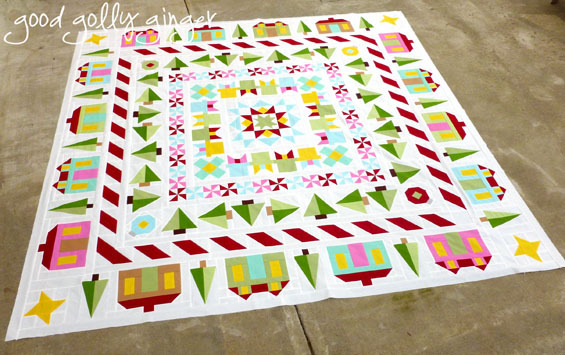 A center radiating star is surrounded by bright Christmas present, peppermints, Christmas trees and ornaments, then a candy cane border, and finally cheery houses with friendship corner stars. It's definitely Christmasy, but not so over the top. I love those little houses! Now it's time to get to quilting! I can't wait to show you the finished quilt...hopefully, next week. This turned out so well, Katy! 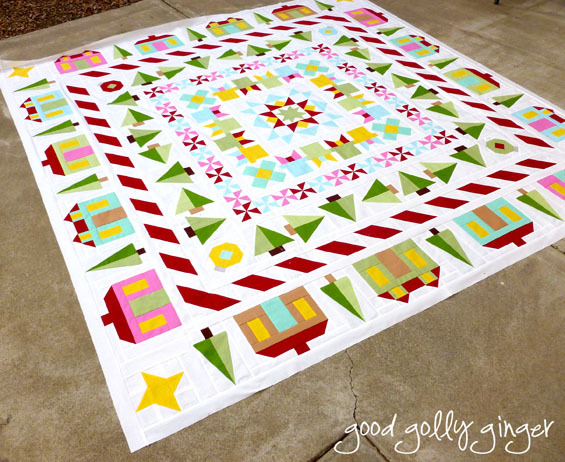 I especially like the candy cane border! i love it! and I didn't even think it was a Christmas quilt, until I really looked!! fantastic!! Holy cow! What a beautiful quilt. It looks so cheerful. Nice job! I love it too! Agreeing with everything Michelle C has to say. PATTERN!? I love this so much! Great work! I love it! It turned out great--the colors, the medallion style, everything. It's lovely. Congrats on your finish. I'm almost done quilting my ALYoF goal... then the binding. :-) First, lunch. This is just amazing. Stunning. Beautiful. The colour just pops off that white background and I love that it's instantly Christmas when you look at it. Fabulous! That is such a nifty quilt! The colors are just so cheery. Wow! You were so fast! Are you going to write a pattern for it? I LOVE it! What a terrific quilt. Your use of solids is quite catching! Congratulations, this has turned out beautifully. And well done for getting it done on time! Wow that is just lovely!!! wtg Looks like Candyland!! Stunning quilt. I love the colors you chose, so bright and cheery! This is beautiful! 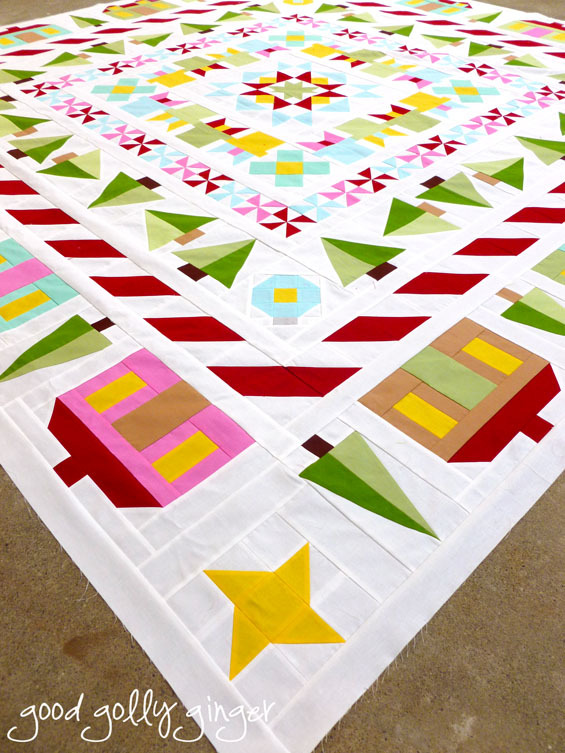 I'm crazy for colorful quilts on a white background and this one is just lovely. Nice colors and I love that it is Christmasy but not over the top. Great job! you just keep adding awesomeness to this quilt! It is so fun! I think the candy cane border is my favourite part! The whole thing looks awesome. I'm usually not into this kind of quilts, but this looks beautiful! Great color choices. I love it too! 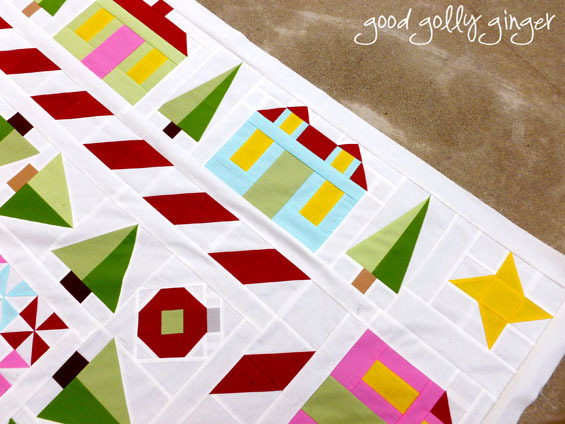 You made a Christmas quilt so different from what we usually see... very fresh and crisp looking too! I am looking forward to the quilting, especially of all the snow surrounding all the beautiful blocks and the trees. Good golly, it's beautiful! So bright and cheerful! I love it! I would love to get the pattern! Wow, I LOVE this! Such a beautiful finish! Can't wait to see how you quilt it. This is absolutely beautiful. I would love it if you would create a pattern for this quilt. Is some of it paper pieced? so gorgeous!!! I love every single part of it.